About FIA - Fukushima International Association - Earthquake!! Tsunami! !How should we protect ourselves from those disasters? Earthquake!! Tsunami! !How should we protect ourselves from those disasters? 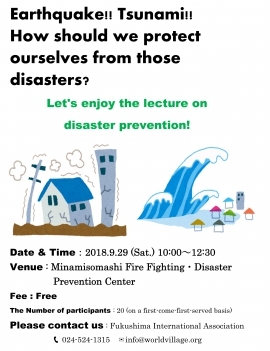 We are looking for people to participate in the disaster prevention lecture at Minamisoma City. The lecture will focus on how to protect yourself during an earthquake and tsunami. When: Saturday, September 29th from 10:00 am to 12:30 pm. before September 29th to sign up for this event. Come join us and learn how to be safe during a natural disaster.